Are you unhappy with your smile? Many people accept and live with a smile they don't like, not realizing that the appearance of their teeth isn't something that is set in stone. We provide cosmetic dentistry in Indianapolis and Carmel to improve the coloration, shape, and position of our patients' teeth, but it does a great deal for the patients' confidence as well. Snap-On Smile as an affordable, pain-free way to a beautiful smile. A complete smile makeover to transform your smile. Show off the smile of your dreams! We'll tailor a cosmetic dentistry plan to improve the color, shape, and position of your teeth. Is Cosmetic Dentistry the Right Choice? Unlike preventive or general dentistry, many cosmetic procedures are optional. This means they are generally not covered by insurance. So it's important to know exactly what your options are available and what will give you the results you want. 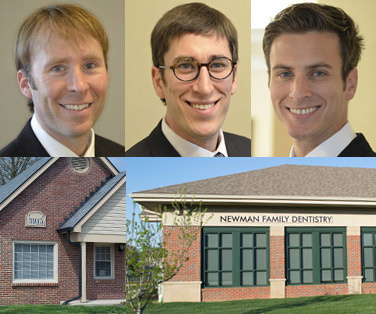 If you aren't sure if cosmetic dentistry is the right choice for you, come into Newman Family Dentistry for a free consultation. Our talented cosmetic dentists can talk with you about your goals for your smile, inform you about procedures that can address your desires, and recommend an appropriate course of action. Whatever your hopes and concerns for your smile, our most important goal is for you to leave our offices feeling happy and confident about how you look. What Does a Cosmetic Dentistry Procedure Entail? Obviously, all patients are different — and so are their dental needs. We tailor your cosmetic dentistry plan to a variety of factors, including your budget, time frame, and desired results. Teeth whitening, for example, can be done in the office by one of our trained specialists for same-day, instant results; or we can supply a kit for you to take home and use at your leisure. More complex procedures such as dental veneers can take several visits — one to prepare the teeth for the procedure and create the impressions for the veneers, another for the final placement of the veneers, and a possible follow-up appointment. Costs for procedures can only be estimated when you visit our Indianapolis or Carmel office for a consultation and examination. Once a plan of treatment has been developed, we can provide you with a firm cost for your chosen cosmetic dentistry procedure. If you have additional questions or concerns about cosmetic dentistry, make an appointment at our Carmel or Indianapolis dental office so we can address them. We are dedicated to providing exceptional dental care for our patients, and this includes elective cosmetic dental procedures!